The problem with jukebox musicals like Mamma Mia! and by extension, its new sequel, Mamma Mia! Here We Go Again, is that rather than flowing naturally from the story, the songs often feel shoe-horned in, as if the story is there to serve them rather than the other way around. Naturally, the draw of the Mamma Mia! films are the songs by Swedish pop group, ABBA. If that's the main draw bringing you to Here We Go Again, then you likely won't be disappointed, as it combines songs from the musical with other ABBA songs not previously heard in the original film. The plot, interestingly enough, takes its cues from The Godfather Part II, juxtaposing the journey of Sophie (Amanda Seyfried) with that of her mother, Donna (Meryl Streep), as a young woman (Lily James). Donna, you see, has passed away since we last saw her, and Sophie is attempting to complete her mother's dream of renovating her Grecian hotel in her memory. As Donna's best friends (Julie Walters, Christine Baranski) and Sophie's three fathers (Pierce Brosnan, Colin Firth, Stellan Skarsgård) descend on the island to celebrate Donna's life, the film flashes back to tell the story of how Donna met all three men, and came to be in possession of the building in the first place. The film drags for most of its nearly 2-hour running time, getting bogged down in a story that we already pretty much know the ending of. 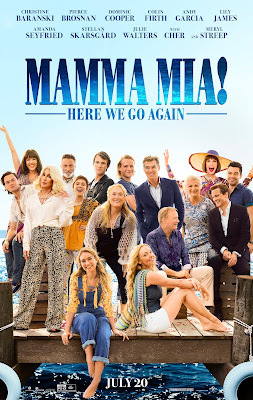 It is admittedly better directed than the original Mamma Mia!, which lacked both personality and visual panache, but what Here We Go Again has in technical prowess it lacks in storytelling and writing. The songs don't seem to fit the narrative at all, and what tenuous connections they do share with the plot seem forced. Its lack of Meryl Streep is also one of its major weaknesses, although when she finally does show up at the end of the film, the film wisely makes the most of her limited screen time. The film is really only worth watching for Cher as Sophie's long-lost grandmother, who doesn't even show up until the film is almost over. In fact, it isn't until Cher's arrival on the island that the film becomes the kooky, campy free-for-all that it always should have been. One has to commend director Ol Parker (Imagine Me & You) for attempting to keep the film grounded in something resembling real emotion, but it is only when he lets the film veer into spectacularly gaudy musical mayhem in its final 15 minutes that it really begins to soar. Watching Cher belt out ABBA tunes surrounded by fireworks and glitter is easily the highlight of the film, and she proves that even at 72 years old she's still got presence and charisma to spare. If only the film had managed to muster up that kind of energy in the previous hour-and-a-half. Here We Go Again may not be as insufferably bubbly as its predecessor, but it also never really justifies a reason for existing, either. It mostly feels like a greatest hits album from Mamma Mia! minus Meryl and plus Cher, although Cher isn't in it nearly enough to save the film. Fans of the original may find something to love here, but otherwise it's just a tidied-up version of something we've seen before. "Here we go again," indeed. MAMMA MIA! HERE WE GO AGAIN | Directed by Ol Parker | Stars Amanda Seyfried, Lily James, Julie Walters, Christine Baranski, Pierce Brosnan, Colin Firth, Stellan Skarsgård, Dominic Cooper, Cher, Meryl Streep | Rated PG-13 for some suggestive material | Now playing in theaters everywhere.